Kayn Sunfury is a blood elf demon hunter. He is a loyal soldier and one of Illidan Stormrage's most trusted lieutenants. Honorable and demanding, as well as a fearless leader and a master strategist, he believes that cooperation and sacrifice are necessary to defeat the Burning Legion. Kayn follows Illidan's ideals to get the job done, no matter the cost. Kayn is one of two characters player demon hunters can choose to be their second-in-command, the other being Altruis the Sufferer, whose ideals and plans for the Illidari are incompatible with Kayn's own. Kayn first appears as a quest giver located at Despair Ridge on Mardum. Kayn feels greatly betrayed by Altruis the Sufferer, a renegade demon hunter who left Illidan's cause, plotted to usurp him, and orchestrated the deaths of many Illidari. For this, he is unwilling to forgive him when they are reunited in the Vault of the Wardens. Kayn sent Kor'vas Bloodthorn to find the demon hunter to report to him immediately at Krasus' Landing. To find the Twinblades of the Deceiver, he and the demon hunter went to the entrance of the Violet Hold guarded by Warden Alturas to not permit anyone to enter the prison. By Khadgar's trust, Alturas had no choice but to let them in. He told them that the Kirin Tor will not be responsible of any sacrifices taken. Kayn stood guard to let the demon hunter confront a eredar named Taldath the Destroyer to get answers of where Varedis Felsoul is. Eventually, the demon spilled out the information without warning and Kayn told the demon hunter to finish him off. Felsoul Hold in Suramar is where he and the artifact is at and got a bat ready for the demon hunter. Lyana Darksorrow and Illysanna Ravencrest were to accompany the demon hunter regardless of the outcome. Kayn warns the demon hunter that Varedis is a cunning adversary. Upon arriving at Felsoul Hold, the demons spotted the bats and Kayn told them to fly to a landing site quickly. Losing both Darksorrow and Ravencrest, the demon hunter leaped into the fray and punish them for their hubris. Kayn sent Kor'vas Bloodthorn to find the demon hunter to report to him immediately at Krasus' Landing. To find the Aldrachi Warblades, he said that Archmage Khadgar had something called a [Crystallized Soul]. They will die in their master's name as will Caria Felsoul. Upon returning to the prison world of Mardum to make it their new home, Kayn addresses to the Illidari of the accomplishments of the demon hunter by obtaining the artifact. With the Fel Hammer in their control, they can plan out every aspect of their assault on the Broken Isles. Kayn was met by the adventurer and Khadgar at Illidari Stand in Azsuna. Surprised and really impressed of the artifact the champion wielded, he told them to assist Allari and Jace as best they can to maintain ground against the demons there. He instructed the champion, Cyana Nightglaive, and Kor'vas Bloodthorn to attack from within the legion camp ahead. Unfortunately with the betrayal of Cyana as an end result, for the Illidari cannot afford to lose even a single demon hunter in their ranks. It was right to put her down and should meet up with the blue dragons that reside at their camp as they can be prove to be a powerful ally in the war against the Burning Legion. Kayn was the first to become the champion's cause in their campaign. After collecting essences to communicate with their master, it was time to seek out other allies. If Kayn is chosen to lead as their second-in-command, they later go on to recruit the Shade of Akama instead of continuing to talking to Akama. The Fel Hammer then jumped to the Legion world of Niskara to take out the Felsoul siblings. With their mission successful, he announced the demon hunter to slayer and told them that their artifact can awaking great potential when the time came. Kayn participated in the Battle for the Exodar battling against High General Rakeesh, alongside Asha Ravensong. Both Kayn and Altruis together on the Fel Hammer. Kayn and Altruis were both aboard the Fel Hammer when the Slayer obtained the [Slayer's Felbroken Shrieker]. Cry Havoc and Let Slip the Illidari! Lord Illidan knows the way. I have sacrificed everything. What have you given? My life is dedicated to destroying the Burning Legion. We are all that stands between the Legion and annihilation. Did you just touch me? I wouldn't if I were you. Normally I hunt demons but for you I'll make an exception. Do it again and your skull will be my whetstone. You're no demon, but I will put you in the ground just the same. I will feast on your soul! Remember, nothing is more important than the Legion's destruction. If we do not meet again... die well. Do not give in to the power of the Legion. Trust in Lord Illidan's plan. We must eliminate the Legion threat on this ridge so that you can bring the rest of our forces in from the Black Temple. Kayn, tell me what you know about Mardum. Eons ago, Sargeras created Mardum to imprison demons. He also created the Sargerite Keystone to lock them away. But when the Titan decided to burn all of creation, he shattered Mardum, sending its fragments hurtling throughout the Twisting Nether. Thus was born the Burning Legion. Sargeras safeguarded his keystone on this particular fragment. It's a 'skeleton key', allowing access to any Legion world. It's also the key to Lord Illidan's plan for the Legion's destruction. <Name>, we must take the fight to the Legion here in the volcano. They must be destroyed before we fly up to the Brood Queen's command ship, the Fel Hammer. Then we'll kill her, take the Sargerite Keystone, and return to the Black Temple to slay the invaders. No small feat, but I think we'll manage. "An honor, <name>. Of course I will serve as your champion and second-in-command. Could it have been any other way? We have only just begun to move forward with the master's plan, but already, you have made great strides. If we are to defeat the Burning Legion, we must remain vigilant. Any other goal pales in comparison. The fate of everything hangs in the balance. At the end of the day, we will stand victorious... no matter the cost!" The Illidari cannot be stopped! Kayn is treated as the default Illidari commander for non-demon hunters, in that it is him, instead of Altruis, that non-demon hunters interact with on the Broken Isles. 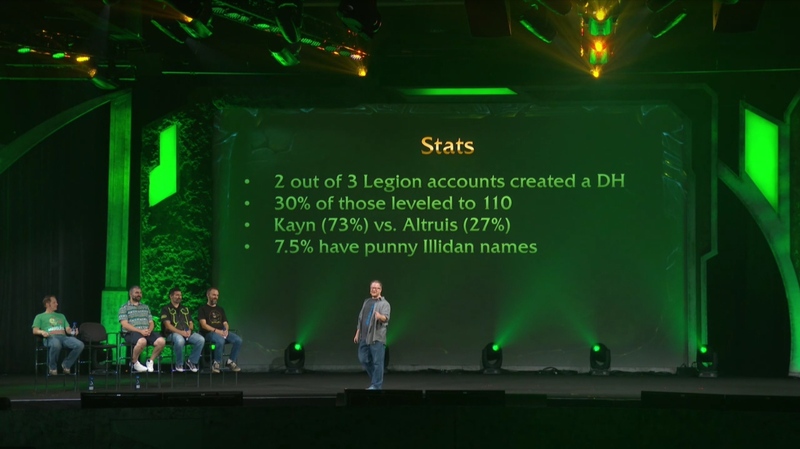 As of BlizzCon 2016, 73% of demon hunter player characters had chosen Kayn as their right-hand-man, with 27% choosing Altruis. His surname is also the name of the Sunfury forces, an elite group of blood elf soldiers; it is also the name of the palace of Silvermoon City, Sunfury Spire. It is unknown if there is any meaning behind this. [Kayn Sunfury's Coin] can be fished up from the fountain in the version of Dalaran. Kayn is voiced by Dave B. Mitchell. During the escape from the Vault of the Wardens, Kayn mentions to Maiev Shadowsong that he, too, has felt betrayal by his own kind. While presumably referring to Altruis' betrayal of the Illidari, it could also be a nod to Kael'thas Sunstrider's defection from the Illidari to the Burning Legion, which Illidan learned of some time before the siege of the Black Temple. This page was last edited on 21 April 2019, at 11:45.